Stoat: The oil industry knew about climate change long before the American public did? The oil industry knew about climate change long before the American public did? Via Twatter, we come to yearsoflivingdangerously.com and their theme, "Big Oil Knew". And it is essentially the same drivel1 as On its hundredth birthday in 1959, Edward Teller warned the oil industry about global warming?, except they've been a bit more careless in their wording. 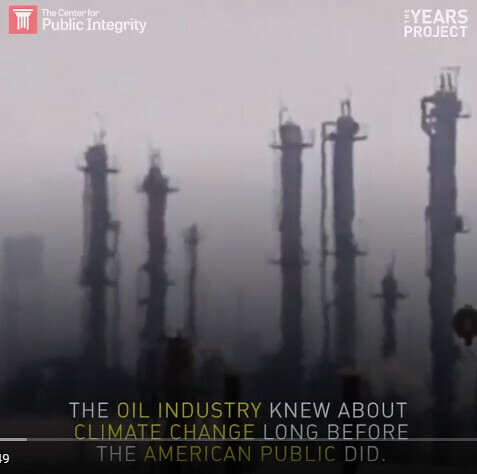 Specifically, see this screen grab: "The oil industry knew about climate change long before the American public did". Oooh, isn't that just calculated to wind you up? Those Evil Oil Executives had secret knowledge that they hid from you. Except, of course, they didn't. They had public knowledge. Joe Public may not have read that knowledge - which is not too surprising, if you'd given Joe Public the report and put a gun to his head he'd probably still have refused to read anything so boring. But the report of the 1959 symposium was published, publically. If newspapers decided not to report it, if the government chose not to disseminate that information, then that was their choice. Of course they are correct - if rather blurred in their timelines - to say that the API and its friends, most obviously Exxon under Lee Raymond, said things sufficiently misleading to constitute misinformation and probably lies. But I don't see that justifies them lying in return. BTW, perhaps you are wondering: "why do you attack these nice people for lying? They are nice people, the sort of people I would invite to a dinner party, and they are lying - well, let us be kind, they aren't really thinking carefully, they're just putting their point of view across forcefully - in a good cause. Why don't you attack the nasty people who lie for bad reasons?" And the answer is of course that I have, but I've done that, just consider it read. 1. It is possible to misinterpret what I'm calling "drivel". Teller was significantly wrong, per the linked post, but his words aren't drivel. The drivel I'm referring to is the claim, re-made in the current stuff, that there was some big secret hidden from the public. * Evaluation of the Study, “Assessing ExxonMobil’s climate change communications (1977–2014)” by Geoffrey Supran and Naomi Oreskes, published in Environmental Research Letters, 2017 by Kimberly A. Neuendorf, Ph.D. February 22, 2018. Via Exxon-Funded Study Rebuts Research That Showed It Deceived Public on Climate, by Climate Liability News. Why do you think Teller's GW thoughtds are drivel? You have misinterpreted me, but on re-reading it is not an unreasonable misinterpretation, so I've added a note to clarify what I mean. The ngram for Carbonic Acid is interesting. We are all victims and share no responsibility for the horror visited upon us and our children. Sounds a bit familiar, if a bit banal. Needs an accent. @-"Nobody would discuss the problem of [Einstein’s theory of] relativity in the media." Latif may be wise, but not accurate. GR and Einstein were high profile issues in the genral public media a short time after the theory had been backed by a significant section of the scientific community. And those who disputed Relativity seem to have preceded their AGW doubting descendents. "Einstein’s opponents were simply not prepared to question their own worldviews and instead sought alternative explanations for why their objections were disregarded by the academics. With time, many turned to conspiracy to account for their marginal status: "
I think he meant "attempt to discuss, productively, the details". Relativity was definitely public news; but I don't see your quote as demonstrating discussion of the details, the way GW is "discussed". "Relativity was definitely public news; but I don't see your quote as demonstrating discussion of the details, the way GW is "discussed"." You might enjoy Wireless World 1987/Relativity Mathematics Mistakes. In a similar vein, Ivor Catt's beef with Maxwell's equations was good entertainment too. @-" "The oil industry knew about climate change long before the American public did". Oooh, isn't that just calculated to wind you up? " The obvious comparison is with the Tobacco industry that 'knew' the scientific evidence that the product they produced and sold was harmful. But then acted to obstruct that becoming generally accepted scientific knowledge 'known' by the general public. It is that similarity that invites the same judgement of a morally reprehensible action. One problem I have with this is that despite the American legal judgement in the Citizens United case, it is far from clear that the philosophical problem of 'personhood' has been solved. The idea that the Tobacco companies, or Exxon, are a unified intentional agent with the sentient ability to 'know' something, to posses knowledge that shapes their moral agency is clearly metaphorical. It may not be very accurate, or even useful to analyse the motivations and actions of a global business enterprise as if it was a single individual human actor. I think it even less likely that applying that reductionism to a reified unity like 'the American Public' or Joe public, is useful. The idea that the level of knowledge and belief held by such an ill-defined entity can be binary or even measurable looks mistaken. It is. And I have two answers. Firstly, that I'm very dubious about the tobacco lawsuits; they look a lot like mob justice. After the surgeon-general has told the USAnians that smoking was bad, they had no more excuses. But also as I understand it, the tobacco companies genuinely did have secret knowledge from their own research. I think the likes of Oreskes keep deliberately blurring that distinction. It seems like a useful concept to me, and the concept of an average reasonable person has a long legal history. @-" But also as I understand it, the tobacco companies genuinely did have secret knowledge from their own research. " As I understand it, the tobacco companies did little more than run the numbers that were coming out from epidemiological research, and confirm the conclusions. After that, as is evident in the tobacco papers, they were VERY careful to avoid any involvement in research into a scientific link between smoking and cancer, but sponsored research into any other linkage or cause. IIRC the asbestos industry used a similar tactic of facilitating research into 'ANYTHING-BUT' causes of mesothelioma that was then employed in media and legal defence against their product. Perhaps it's too Soon to be Happ(y)er that the FF industry isn't doing the same ? @-"and the concept of an average reasonable person has a long legal history." The antiquity of a legal fiction only confers legitimacy in the context of case law. The average reasonable person has been invoked as opposing the abolition of slavery, votes for women and civil rights. And as an advocate for the same. The usefulness of the concept would seem to be as a rhetorical device, rather than any meaningful measure of significance. Trump and science: malice or indifference? Is Bruno Latour a useless ponce?